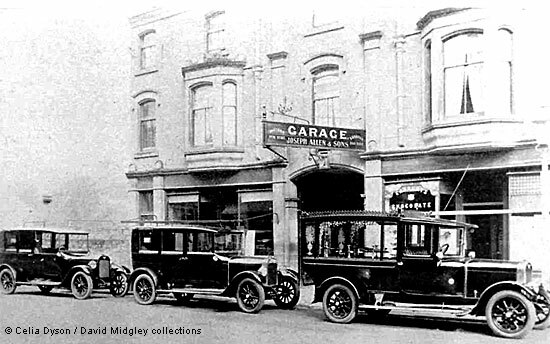 Joseph Allen bought the Crown Square garage and shops, together with the living quarters on the first and second floors, from William Furniss in July 1916. The premises were known as the "bottom yard" within the Allen family. The photograph above shows three vehicles in the Allen fleet in 1924. There is a hearse on the right. Funerals were the most successful aspect of the business and in the 1920s Joseph Allen's grand-daughter, Ethel May, noted that they were almost a daily occurrence. Joseph and his first wife had moved to the Matlock area about 1876. Joseph was employed as a stoker at the Matlock Gas Works which had opened on Bakewell Road in 1876. According to Ethel May "Joseph worked the night shift from 10 p.m. to 6 a.m. After a year or so he borrowed £100 from a friend, Mr Needham, to buy a horse and cart, and began to cart coke from Matlock Gas Works to Chatsworth. ...his wife looked after the horse in the daytime while he slept and had it ready for him in the early morning for the delivery to Chatsworth". In fact, Joseph and his sons continued to transport coke to Chatsworth until the First World War, when the war-time emergency meant coke could no longer be used to heat the 'Stove' and all the plants died. By 1881 Joseph's days as a stoker were over; he had won a contract to cart coal from Matlock railway station to the Gas Works, with coke loaded for the return trip. In many ways this contract was the foundation on which Joseph Allen was able to build his successful business. It is significant that when Joseph died Mr Brown, manager of the Gas Works, attended his funeral and a floral tribute from the "directors and officials of the Matlock and District Gas Company" suggests that Joseph Allen carted for the Gas Company for more than 50 years. Extracts from the Minutes of the meetings of the Finance Committee of the Matlock Gas Works, 1899-1906. By the time these minutes were recorded, most of Joseph's sons were working also working alongside their father as carters. The Allens' first home in the Matlocks was on Hackney Lane but in the middle to late 1890s they moved to Dimple Farm. Joseph initially rented the property from Sarah Drabble and her sons but bought the farmhouse, outbuildings and land outright In 1903. He financed the purchase by borrowing £2,000 from Thomas Evans, a licensed victualler of The Green, Matlock. The farm's outbuildings offered stables for 12 horses and the big barn had room for both carriages and charabancs as well as a hearse and coal carts. By 1901 Joseph described himself as a cab proprietor and farmer, and four of his sons were cab drivers although most of their work was still carting. The first newspaper account of an Allen hearse being used for a funeral was in August 1903. 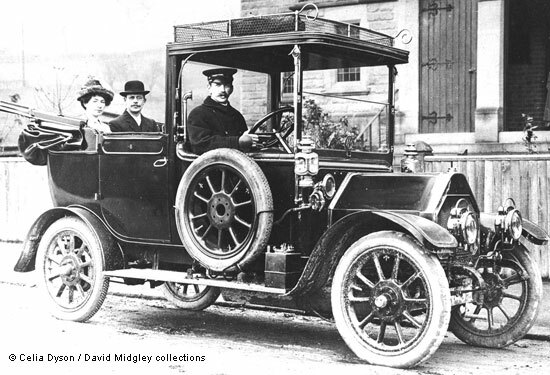 Two months later Joseph generously provided a complimentary hearse for the funeral of George Merrington Porter, a member of Matlock Fire Brigade from its inception. A grandson, William Eric Allen, wrote that his "earliest recollection is that he had 11 or 12 horses, all black of course, to be used for funerals (and carting)". The purchase of a motor hearse around 1916 meant they could undertake funerals even further afield. It is quite possible that another Matlock cab proprietor, William Hands, encouraged or at least influenced the Allens in their decision to invest in motor cars. The first Hands vehicles were bought not long before the Allens made their first purchase, and came from the same manufacturer. Hands also supplied Joseph Allen with petrol. Between 20th and 28th June 1912 William Allen, Joseph's third son, visited the Belsize factory in Manchester. Presumably this was to learn how to drive the vehicle that was about to be purchased by his father (shown above). "to Monsal Dale via Haddon and back by Chatsworth with Furniss bus passengers". Farley Congregational Sunday School Treat, 1914. Members of the Allen family drove the "cabs". 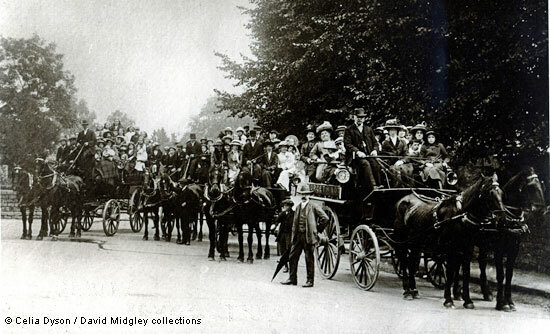 Joseph Allen Senior is shown driving the horse-drawn carriage on the far right; it was called Forget-Me-Not. The next cab was driven by his son William, then came Frederick and Jack (John Thomas) was holding the reins on the far left vehicle. When Joseph Allen purchased the Crown Square garage he had hoped to finance the transaction by selling the Belper business, and asked Joseph junior to live above the new garage and run that side of the business. However, Joseph junior wanted to remain in Belper so a mortgage was taken out with the London City and Midland Bank. This was quite a difficult time for the family as Joseph's eldest son John Thomas (Jack) had only just died whilst undergoing Army training, William was serving in the Army and George was working on the farm. Frederick Allen was, therefore, chosen to take over the new garage and he and his family moved into the living quarters above the shops. The death of his father, Thomas Allen of Belper, in January 1907, helped Joseph to further establish himself as a cab proprietor. Joseph persuaded his brother Willoughby Allen that the business should continue under Joseph's control rather than be sold. This resulted in Joseph junior moving to Belper with his family to run the business there. 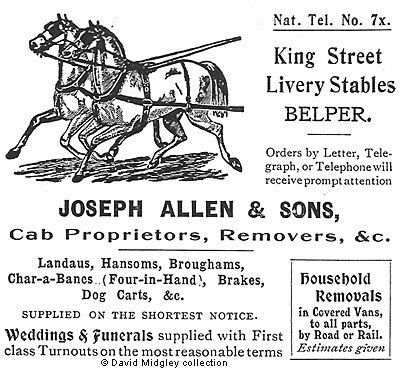 Whereas the Matlock business remained as "Joseph Allen", the Belper branch became "Joseph Allen and Sons"
Advertisement for Joseph Allen & Sons, of King Street, Belper, 1909. William, Frederick and George became partners from 1st January 1921 and were expected to devote their full time and attention to the business. Each of them received a one-quarter share of both the freehold property (i.e. Dimple Farm and the Crown Square premises) and the stock, plant and machinery. It was very physical work, with long working hours. Joseph Allen remained solely responsible for the employment and dismissal of employees, the giving of credit and the compounding of debts. 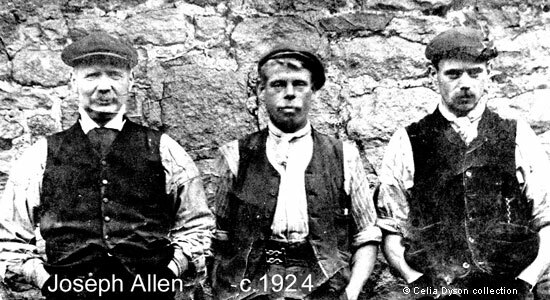 Joseph Allen with two of his employees, about 1924. Joseph is standing on the left, next to him is Harry Smith and on the right is David Maskrey who lived at Ward's End. In 1925 Maskrey and Joseph Allen were both fined for ill-treating a horse. By 1925 Joseph Allen and Sons advertised as both farmer (the Dimple) and jobmasters, motor car proprietors, and funeral furnishers (Crown Square Matlock). The same year a hearse owned and driven by Joseph overturned at the junction of Bank-road and Wellington street. He was going to pick up a coffin for conveyance to the churchyard. He was undoubtedly collecting it from his friend George Ballington, the Rutland Street builder and joiner who would have made the coffins. This splendid funeral cortege was for John William Wildgoose, the Matlock builder and contractor. Mr. Wildgoose died on Saturday 28 April, 1923; he was 61 years old and had succumbed to acute bronchitis, something that antibiotics can cure today. He had been the treasurer of the West Derbyshire Liberal Association for many years and was a well known Primitive Methodist. His firm had been responsible for many large works, public buildings and housing schemes in his lifetime and one of the last jobs he saw completed was the former Cinema House at the bottom of Steep Turnpike. The first carriage, with the coffin and floral tributes, has stopped outside the Primitive Methodist chapel on Bank Road. Joseph Allen was driving the hearse and his son William was driving the first carriage. Joseph Allen senior died in June 1933. As he had regularly driven the hearse it was estimated that he had attended some 5,000 or more funerals. His youngest son George then moved into Dimple Farm with his family but in early 1945 Dimple Farm was sold to Mr. Millward. The following year Matlock Council bought Dimple Farm by compulsory purchase and the land was used as a Council rubbish tip in the 1950s and 1960s. George and William Allen retired from the firm in 1946, at the ages of 61 and 64 respectively, and the partnership was dissolved. Frederick Allen continued to run the taxi and funeral business from Crown Square for a time. He later passed it on to his stepson, Jack Bannister. Based on the extensive © notes and research of David Midgley, and includes passages from a booklet he prepared for family members. Photographs © Celia Dyson and David Midgley. Written and further research by and © Ann Andrews. Intended for personal use only. Documents in Glynn Waite's collection show that this was a private sale, following an unsuccessful public auction. Extracts from the notes of Ethel May Allen. Joseph Allen was farming in Darley. See Kelly's Directory of Darley, 1891. "Derbyshire Times and Chesterfield Herald", 30 Jan 1897 and 6 Feb 1897. Sale by Joseph Hodgkinson on Wed 10 Feb 1897 under a Deed of Assignment re L. T. Wildgoose. Sale of cattle, horses, fowl and chickens, farming tools etc. It is likely that the Allen family moved in afterwards. Thomas Evans kept the Horse Shoe Inn on Matlock Green. See him in the 1881 census | in the 1891 census | in the 1901 census. Joseph Allen finally paid off this debt in 1923. See the family at Dimple Farm in the 1901 census. "Derby Daily Telegraph", 17 October 1903. George Merrington Porter had died Matlock Green, aged 54 on Thurs 8 Oct. 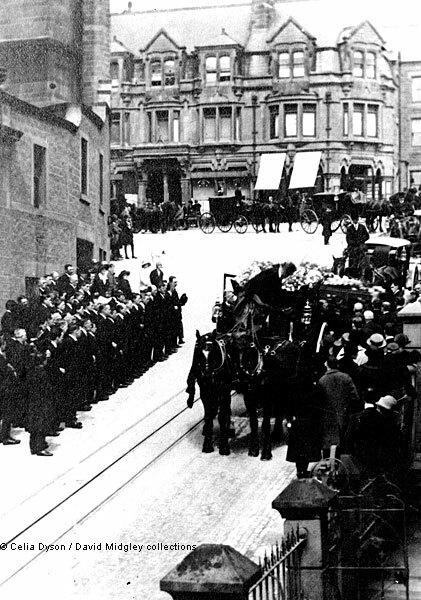 The men of the Fire Brigade had intended to carry their late comrade's coffin, but "Mr. Joseph Allen of Matlock Bridge, whose hearse was there in connection with Mr Brookhouse's funeral, kindly offered its use". Entry from William Allen's notebook/diary, owned by his grandson David Midgley. The name of the carriage comes from Bunting, Julie (2002) "Matlock and Matlock Bath", Tempus Publishing Ltd., ISBN 0-7524-2455-6. Joseph Allen sent his son, Joseph junior, to Belper in 1892. He was to be trained and to learn about that business so he could take eventually take over after his grandfather, Thomas Allen, had died. Kelly's Directory of Derbyshire, 1912, shows the Belper firm as Joseph Allen & Sons, jobmasters. Advertisements in earlier directories list Thomas Allen first as a fly proprietor (1891), and later as a jobmaster (1895 and 1899) with premises in Chapel Street, Belper. Joseph's granddaughter, Ethel May, recalls her father working from 6 a.m. to 5 p.m., with two half hour breaks for breakfast and lunch. Sunday as the only day off. "Derby Daily Telegraph", 9 April 1925. Cruelty to a Horse. He advertised in Kelly's Directory in 1925. His name is also listed in Kelly's Directory, 1895. His name appeared in Matlock directories from then on : Kelly's Directory, 1899 | Kelly's Directory, 1908 | Kelly's Directory, 1912 | Kelly's Directory, 1916. "Derby Daily Telegraph", 1 October 1925. Mr. Allen was not injured but the hearse was extensively damaged. A motor hearse was summoned instead, and the funeral cortege was able to start without further delay. "Derby Daily Telegraph", 30 April 1923. Matlock Gentleman's Death. "Belper News", 16 June 1933. Death of Mr. J. Allen. "Derbyshire Times and Chesterfield Herald", 9 February 1945. The sale was to be in early March. "For Sale, Dimple Farm, Matlock, with Possession; Valuable Building Land and Dwelling-Houses at Wilmot Street, Matlock".